Based on the fine write-ups listed at the bottom of this post, portions of the new Section 199A deduction for qualified pass-through business income has been added to the case study spreadsheet. The most recent version is at https://drive.google.com/file/d/0B45krBaG0b6KTWZDeXEySVBHVXc/view?usp=sharing. - W2 wages paid, and qualified business property owned, by the business. - Deductions are not determined separately for each business. Suggestions, corrections, and comments welcome. Hi MDM. I'm just poking around with your spreadsheet... two initial questions and a comment. Question #1: Where does the QBID number show up? Sorry, I looked but I am missing it.... Ugh. Er, surely you have better ways to spend your time. Unless you're a farmer. #1 - Great question, and I should have been more explicit. The result is in Calculations!G14. The 3 inputs that don't come from inputs needed for "regular" tax calculations are in Calculations!Y140:Y142. #2 - Haven't decided the best way to use REIT income. E.g., it could be a separate line item for the "regular" tax input (which could require folks to separate their 1099 numbers) or a separate input in the QBI calculation block (which could lead to confusion about whether it should be entered in two or only one place). For rental income, do you expect one can use net income from schedule E (which includes the depreciation subtraction), and if so how losses will be treated? I pretty much decided to punt on this until IRS guidance arrived, but if you have (or anyone has) a very good idea of what is coming, that would be great. As for (what I perceive as) the more complicated S Corp and partnership issues, well, I'm not trying to compete with the TurboTax, etc., folks, nor even with the gentleman who does Federal Income Tax Form 1040 (Excel Spreadsheet) Income Tax Calculator. The original purpose of the Case Study Spreadsheet was to help people with the simple math of adding expenses and estimating net income. 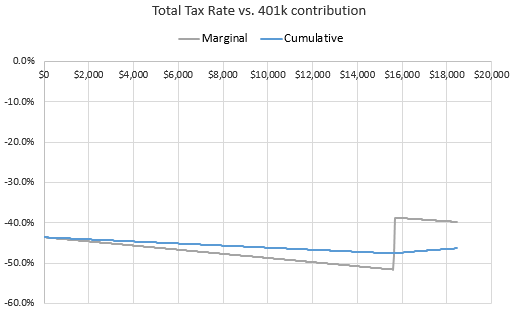 Over time, the tax calculations have evolved into (what I think is) a pretty decent system for evaluating both tax due and the marginal rates one pays (or saves) along the way - for individuals with primarily W-2 and 1099 income. I think the partnership and S corporation may be simpler for spreadsheet to handle than is at first apparent. I think--and maybe I'm missing something--that this info could simply be combined with rental income. Your rental income and expense amounts, then, cover all the Schedule E stuff. BTW, I think it's fine you don't handle the W-2, depreciable assets and specified service trade or business limitations. Those won't affect many folks. I need to think a bit more about this, but I think think losses on some qualified business income 'generator' will need to be carried forward to future periods and in those future periods will reduce QBI. But let me ponder this, look again at the statute with this question in mind, and then give a better answer. This truly may fall into category of 'going way too far into the weeds.' As you wisely note, you're not attempting to replace TurboTax. I also think some of this complexity probably goes beyond TurboTax. I think I had read something and assumed I didn't qualify for this - then today it came up again, and now it is like what? I feel like we're high income and I'm definitely in a service business, but we are decidedly not over the MFJ limit for this - I can shelter 18K + 20% into the soloK, and then take another 20% off? Seriously? Of course MDM has already put this into the spreadsheet. ...and just happened to be reviewing this very thing. At one point it seemed the term "taxable income" (e.g., see https://www.irs.gov/pub/irs-drop/reg-107892-18.pdf) would be the same as "Adjusted Gross Income" (AGI). But, although I've yet to find a specific IRS definition as it applies to QBI, posts such as Rules For Deducting Qualified Pass-Through Business Income lead me to believe "taxable income" for QBI purposes is "AGI minus the standard (or itemized) deduction." Enough things have accumulated that I'll probably upload a new version sometime soon. Meanwhile, if one wants to use "AGI minus deduction", simply change cell Y134 from =G11 to =G11-G13. I thought I also saw something that indicated capital gains wouldn't be included either? So AGI minus deductions minus capital gains. I don't have a source for this, but it was probably from the guidance published in early August or from commentary on that guidance. Thanks - a capital gains deduction is already in the spreadsheet. Whether it is in there correctly...? All I know for now is that the spreadsheet matches all the relevant examples I've been able to find. earned $500,000 in wages as an employee of an unrelated company in 2018.
not related to X, B and C’s total taxable income for 2018 is $270,000. finally today, I notice the 'Open with Google sheets' at the top. and I still have no idea what to do. First line says use the Calculations Tab, Ok, where is that. Can someone walk me through this? It definitely works better in Excel than in Sheets. See Any Google Sheets knowledge? It opens in the Instructions tab. The Calculations tab is the second one from the left - see the bottom of your screen. OK, that's better I have more working knowledge with Excel than sheets. So, I have managed to open the program in Openoffice in the read only mode. OK finally found the calculations tab at the bottom of the page. Now that I have it open- WOW, you have put a lot in there! Row 30: Schedule C net profit. The inputs more or less follow the order on Form 1040. And where does my healthcare insurance deduction go? Cell B72 has $6,434 in it, I don't know why, zeros in 68 thru 71? SEP contributions could be included in row 48, Traditional IRA. Note that no check is made to enforce compliance with the various IRS rules on IRA, 401k, HSA, etc. contributions, so having a number >$5500 there will work. If pre-tax cafeteria plan, in row 4. If post-tax, in row 113. If Self-employed health insurance deduction, perhaps row 47? Row 72 is your after-tax income. Will it calculate properly if I add my max IRA and Max SEP contributions and put the sum in row 48? I find this, "You can contribute up to 20 percent of your "adjusted net earnings" from self-employment to a SEP"
What line is my "adjusted net earnings"? Oh, sorry, I see it now, that is a monthly number. If you can find a definition for "adjusted net earnings" we may be able to determine what existing line fits this, or perhaps add a calculation for it. I don't know where that page is but, it was not accurate. Here is a pdf by Fidelity that gives me the same answer that is on my 2017 1040. I'm assuming no change in 2018. Please see the last 5 words of the last sentence and help me make any sense of it. EDIT, I can't read my picture, but if you click on SEP.jpg it's easily readable. Cell G23 gives me a $400 Savers Credit, what triggered that? I do have an HSA, SEP and IRA. and also 'alimony paid' (Cell A47) will trigger the 'savers credit'. That's a note to self and others. I'm disappointed, I can get down to $1,129 Federal tax but I can't add any LTCGs in the 0% tax bracket. They start at 15%!! EDIT 15% >>> WRONG, it is closer to 1.5%. My error reading my calculator. If I add $60,000 of LTCG, the spreadsheet only adds $1,223 tax, or 2% on $60,000. Seems like it should add 0% or 10% or 15%, not 2%. Doesn't seem right, MDM, if you are interested, private message me and I'll send a copy for you to look at. If I add $60,000 of LTCG, the spreadsheet only adds $1,223 tax, or 2% on $60,000. Seems like it should add 0% or 10% or 15%, not 2%. Doesn't seem right, MDM, if you are interested, private message me and I'll send a copy for you to look at. Probably a weighted average. $51850 at 0% plus 15% of $8150 or some such. I'd be happy to look at it - you could save it to a Google Drive and PM the URL. - put D27 in cell G106. - click the "Update chart" button near cell L113. - Look at the chart above cell G106: is the marginal rate for LTCGs zero for most of the dollars below $60,000? See cells U53:W63 for the Form 8880 (aka Saver's Credit) calculations. Ok spreadsheet filled out with self employed income LT and ST gains, HSA, SEP, IRA, taxable interest, divi, etc. Cell D27 is LTCGs I put in the following values and got the Federal tax shown. $11,830---$1614 $400 tax on $5 more?? Just read your next post before I posted this, If you can make sense of the numbers above let me know. otherwise I'll figure out how to save to google sheets and send you a PM. Probably losing eligibility for a saver's credit tier. Saver's credit tiers are based on AGI, regardless of whether the income is ordinary or LTCG. Reaching the point at which LTCGs become taxable? Oh, very good sleuthing, thanks for your input. but it looks like I can realize about $54,000 in LTCGs and only pay $400 additional tax or 0.8%. Is there any line for a Roth conversions or would that just go in Cell D31 'tIRA distributions'? and pay 4% tax, or $30,000 at 7% or $50,000 and pay 10% tax. I just checked and about 55% of the money in my regular savings (not tax defered) is Long Term Gain. So, am I correct that I could withdraw $100,000 and show $55,000 of LTCGs in Cell D27. Seems obvious, but I have never taken money out of my regular saving at Vanguard. Yes, that's a negative marginal tax rate on LTCG income, meaning (within the assumed income limits) the more LTCGs you realize, the less you pay in federal income tax. But before you take a bunch of LTCGs in this situation, it may (or may not) still be better to do traditional->Roth conversions at these low rates. Depends what rates you will incur in future years. See the '0% LTCG or t->R' tab in the spreadsheet for a back-of-the-envelope estimate. dental college tuition, $35k to $40k in January and again in June. So maybe in the future I can do Roth conversions. Did you get to open my Google sheets, just wonder if I ever got it authorized for you. Thanks for all your help, I may have more questions as we get closer to the end of the year. the same tax situation, (except for QBI). Does anyone want to humor me and dumb this all down a lot, using a round number scenario? Assuming the two adults are married, children are under 17, and that you could really deduct the 20k of rental loss (I am thinking you maybe couldn't because some may have to be depreciated), the following is what I believe would happen with the new tax law. Disclaimer: this is not tax advice. @MMbergmann thank you and disclaimer acknowledged. I was assuming that is how it worked but I was hoping somebody would confirm without me messing it up by trying to explain what I thought. I have not been able to get the spreadsheet to open for me to use our real/estimated numbers so I appreciate the explanation. Are you trying to use Excel or some other spreadsheet program to open the file? Excel does work better than Sheets, LibreOffice, etc. Other than subtracting 1/2 of the SE tax, the spreadsheet gives the same numbers as MMbergmann's note. If all children are <17, the spreadsheet has the IRS owing you $1,365 due to the child tax credit. Yesterday I couldn't get it to open at all but I tried again today and it came right up. I did download it to open in Excel because I am more comfortable using that. Now I cab play around with it, when I get some free time. Thank you for spending the time to create this, it looks very detailed! One of the kids is over 17 but hasn't graduated yet, I guess that doesn't matter. Also as a note, I assumed his LLC was an S-corp (since he also had wages), thus why I didn't do anything with SE tax. W2 wages are from non-LLC spouse. However, I understood that I not only didn't give you a complete picture, you were also not giving complete tax advice so your original response still answered my question of explaining the pass-through deduction. Thank you for your work! I find this MUCH easier to use for planning vs H&R Block 2018 Premium I just purchased. 1) Where is QBI used in calculations? I see Y150 where I have the number of deduction calculated for me and wonder where is it adjusting my income on the main spreadsheet? 2) What is the difference between Line 7 (Employee Sponsored HSA) and line 45 (Personal HSA)? I.e. I set aside $6900 per year to be subtracted from my paycheck and transferred to HSA provider automatically which I can then spend/invest/etc. is this Employee Sponsored or Personal HSA? Short answer: G14 (in the most recent version). The QBI deduction (aka pass-through deduction) comes after the standard or itemized deduction from adjusted gross income. See rows 7-10 on https://www.irs.gov/pub/irs-dft/f1040--dft.pdf. Line 7 is the employer sponsored HSA. That is HSA money the employer deducts directly from your paycheck, and it appears this is your situation. When this happens, you don't pay FICA tax on the HSA amount. Some people don't have the HSA amount deducted directly from their paycheck, usually because the employer doesn't provide the option. They can still make a "personal" HSA contribution (e.g., by sending a check to an HSA provider) and get the HSA deduction on income tax, but the HSA amount is not deducted from the wage base used for FICA tax. If I understood correctly (see below to check), you are firmly within the 22% federal marginal rate. For most people, that would indicate traditional contributions are likely better than Roth. All depends on what marginal rate you expect to pay on withdrawals from traditional accounts after retirement. Good luck! Thank you. Any idea of why such a difference with FIT results depending on whether I enter the same amount (6900) in line B7 or line B45? Shouldn't it be essentially the same for income tax purposes? line B7 reduces FICA base while line B45 reduces AGI post calculations. Perhaps B7 is set to receive an annual amount, while B45 is monthly? E.g., if you enter =6900/12 in B45 does that give ~the same result as 6900 in B7? Both are annual if I read it correctly... may be a bug in a formula?